Jaci was born and raised in a suburb of New York City. She was raised with an abundance of pocket pets, small birds and a couple of dogs. Upon college graduation, Jaci made the cross country trek to Oregon. She started work at an emergency hospital as a kennel assistant and then a veterinary assistant. Her experiences over the course of her three and a half years there spurred her love of emergency and critical care medicine, as well as her love for cats! Jaci and her wife have now rescued more than a handful of cats, all of whom have taken up permanent residence. They also share their home with their quintessential big, yellow rescue dog and several backyard hens. 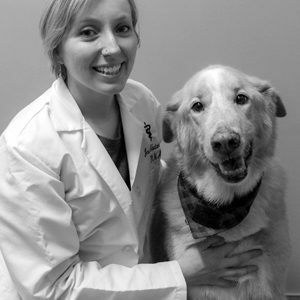 Upon completion of her veterinary degree at Oregon State University, Jaci completed an internship in emergency and critical care medicine at DoveLewis Emergency Animal Hospital and ICU. In her spare time, Jaci enjoys perfecting her cat lady skills a.k.a. knitting, and spinning yarn. She is also a season ticket holder for the local professional women’s soccer team and tries to never miss a game. Go Thorns!